Having left Honfleur, Sunday morning at 8:30 a.m., we are through the lock to the Seine by 9:00 and we are cruising downstream at warp speed, 10 knots, speed over ground. I’m finally enjoying my cup of coffee and morning croissant, though a faint order of diesel lingers on my hand. We escaped, unscathed, so a little diesel with my coffee is acceptable. We are feeding off the starboard fuel tank, little used since leaving Ireland. I want to balance the boat. I am running the fuel polisher, a larger fuel filter and water separator, which filters 90 gallons of fuel per hour. The only downside to running it while underway is that it does cause a slight reduction of fuel pressure to the engine. Though this has never been a problem. As we exit the Seine, the color contrasts are marked. Brown mud color for the Seine outflow and blue-green for ocean water. We turn northeast, speed slows to just above 5 knots, but the current will change in our favor in the next hour. A couple hours later, the current is favorable, but not as strong as I had hoped. At best, we are getting an extra knot. I decide I better check on the filters in the engine room. I am surprised to see another 2” of water on the bottom (it’s a glass bowl) of the fuel polisher. I turn it off and drain the water. There is also a little water in the primary engine filter (there are two side by side. I can select either one or the other or both or none). I switch to the other filter and also drain the primary filter. Our speed has increased to 8.4 knots. We are north and east of Le Harve and have about 170 nm to go to Vlissingen. I estimate our ETA of 04:00 Tuesday morning, using an average speed of 6 knots, which I think is on the slow side. We are starting to roll a bit, only 8°, so we deploy the paravanes. We lose about 1/3 to ½ knots, but the roll is reduced to less than 2°. I go check the filters again and now am dismayed to see a lot more water in both the primary engine and the fuel polisher (FP). In addition, the FP is showing a vacuum of 23”, with 10” being the point I should change it. It is full of crap and must be changed now. I am worried. It means there is far more water in that tank than I had expected. I must change them again, while underway, at least I think that should be no problem. I switch the Racor to the other filter, and within a minute I hear the engine laboring; then die before I can do anything. I immediately think back to this morning when I had changed this filter and as I had primed it using the electric fuel pump I installed just for this purpose, I had not let the fuel spray out the top like I normally would to ensure the filter had no air. Instead, I half assed it not wanting to get more fuel on myself. Sitting there bobbin in the English Channel was sort of peaceful. The engine room is almost cozy. It’s warm, not too hot and very little boat movement is felt. I think I should one day sleep down there, but won’t due to the little issue of possible carbon monoxide poisoning. (For that reason one should not cruise with the salon doors open). OK, I tell Pierre-Jean to turn off the key and thus turnoff the low oil pressure buzzer. And I take my time changing the two filters and then priming all three again. A few minutes later, all set, ask him to start the engine, it starts, I turn on the fuel polisher, the engine stops. Now, Pierre-Jean is starting to show concern in his voice. What’s happening? I tell him, don’t worry, be happy, start the engine again. He does, it does and as I fiddle with the valves, turning off the electric priming pump, I am slow to turn on the gravity feed valve, so the engine dies once more. A few shenanigans later. I reset everything, re-prime everything. Go to start the engine myself, because I know it will need a bit of throttle and it starts, slow at first, but within seconds, back to its normal pitch and ready to go. While doing all this, I also decided enough of trying to see what is going on with the starboard tank, now; it was a matter of not wanting any more problems with fuel. I switched back to the port tank, turned on the FP and it ran until docked 36 hours later. Vacuum never got above 3” no more water was seen in it or the primary engine filter. We were back underway. The only problem with this kind of stuff is the anxiety it causes. For those next 36 hours, every visit to the engine room was filled with dread. Would there be water? Would the filter be clogged? Did I have two tanks with water in them? As things got ever rougher, every check increased my confidence that at least that problem was solved. That’s a huge relief. With the paravanes out, we look like really trawler, so for the second time, we got buzzed by a French military plane. I suppose wanted to make sure we were not trawling for real. By Sunday evening, at 18:00 the winds were from the NE at 10 knots. Going into the winds at 10 knots is not a problem, at about 14 to 15 knots it starts to become an issue. Since one is going into wind driven waves the period of the waves from the boat’s perspective is reduced, causing the boat to pitch up and down more. This up and down motion, besides being uncomfortable, also greatly reduces the speed of the boat and conversely increases fuel consumption. Our speed was down to 5 knots, little did I realize that we would never go as fast again. By midnight, we were down to 1.9 knots. This was partially due to a reduction in rpms because of the oncoming seas, but I made yet another mistake my not think this through. I had the watch until midnight, and then Pierre-Jean took over until 04:00. During that time I went to by cabin to try to sleep. But we were pitching more and more and I found myself bracing by feet against the wall at the foot of our bed every few seconds. I only got about one hour sleep in the four I was off watch. 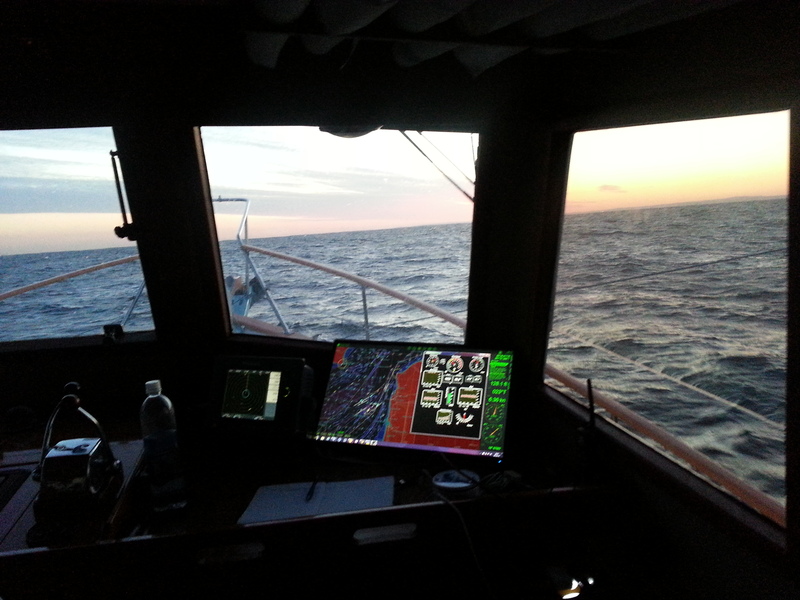 As I came back on watch at 04:00 Monday morning, winds were now NE at 15 gusts to 20; seas were only 3’, but right on our bow and very short period. We were pitching about 3° up and down and the rolling was about 4° to each side. Speed was up again with the current to 4.5 knots. But again, I was not understanding that when the current was with us, it would give us a one knot boost for about 4 hours; yet when against us, it would be a negative 4 to 5 knots for 6 hours. The winds were acting just as forecast three days ago: Less than 12 knots on Sunday, increasing thereafter. Monday morning, faced with these facts, I should have planned a port for an early afternoon arrival. Pierre-Jean wanted to press on; but so did I. I simply did not want to deal with another country, Belgium. Getting to the Netherlands would make my life easier; form a new phone SIM to better rail transportation. Also, we would be in protected waters so it didn’t matter what the weather did. All the right reasons for going on, but clearly ignoring the reality. It had been 24 hours since our departure. Fuel and fuel filters were now OK. But winds were gusting to 20 kts and I knew it was not going to get better!!! As I look at my log, even now, I am having a hard time understanding what I was thinking. The above rationale notwithstanding, by 14:00 our speed was down again to 2.5 knots, the winds were right on our nose at 20 gusts to 25, the seas were now 4 to 6 feet and our pitching and rolling had doubled from earlier in the morning. Now was the time to bail out and head for a harbor. We were 12 miles from Calais! Going at our glacial speed it had been off the starboard quarter for hours. We didn’t and paid the price for the next twelve hours.